The term "video game console" is primarily used to distinguish a console machine primarily designed for consumers to use for playing video games, in contrast to arcade machines or home computers. An arcade machine consists of a video game computer, display, game controller (joystick, buttons, etc.) and speakers housed in large chassis. A home computer is a personal computer designed for home use for a variety of purposes, such as bookkeeping, accessing the Internet and playing video games. While arcades and computers are generally expensive or highly “technical” devices, video game consoles were designed with affordability and accessibility to the general public in mind. First released in Japan on October 21, 1998, the Game Boy Color (abbreviated as GBC) added a (slightly smaller) color screen to a form factor similar in size to the Game Boy Pocket. It also has double the processor speed, three times as much memory, and an infrared communications port. Technologically, it was likened to the 8-bit NES video game console from the 1980s although the Game Boy Color has a much larger color palette (56 simultaneous colors out of 32,768 possible) which had some classical NES ports and newer titles. It comes in seven different colors; Clear purple, purple, red, blue, green, yellow and silver for the Pokémon edition. Like the Game Boy Light, the Game Boy Color takes on two AA batteries. It was the final handheld to have 8-bit graphics. Microsoft's Xbox was the first dedicated video game console released by the company in North America on November 15, 2001, in Japan on February 22, 2002, and in Europe and Australia on March 14, 2002. Microsoft realized the power of video game consoles and feared with growing capabilities they may take over more than the living room. 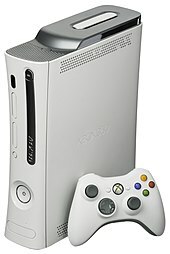 It was the first console to employ a hard drive right out of the box to save games, the first to include an Ethernet port for broadband internet, and the beginning of Microsoft's online Xbox LIVE service. Microsoft was able to attract many PC developers by using the NT kernel and DirectX from their Windows operating system. Though criticized for its bulky size and the awkwardness of its original controller, the Xbox eventually gained popularity, especially in the US, where it outsold the GameCube to secure second place, due in part to the success of the Halo franchise. The original Xbox One, Microsoft's eighth generation console, which has since been superseded by two upgraded models, the Xbox One S and the Xbox One X. ^ The first generation of video game consoles began with the release of the Magnavox Odyssey, the first commercial home video game console, was released in May 1972. This generation came to an end when Nintendo discontinued the Color TV-Game series in 1980. ^ The second generation of video game consoles began when the Fairchild Channel F was released in May 1976. This generation came to an end when Atari discontinued the Atari 2600 on January 1, 1992. ^ The third generation of video game consoles began with both Sega and Nintendo releasing SG-1000 and Nintendo Entertainment System (known in Japan as the Family Computer), respectively, on July 15, 1983 in Japan. This generation came to an end when Nintendo discontinued the Nintendo Entertainment System on September 25, 2003 in Japan. ^ The fourth generation of video game consoles began when the TurboGrafx-16 was released on October 30, 1987. This generation came to an end when SNK discontinued the Neo Geo in 2004. ^ The fifth generation of video game consoles began when Panasonic released the 3DO Interactive Multiplayer on October 4, 1993. This generation came to an end when Sony discontinued the PlayStation on March 31, 2005. ^ The sixth generation of video game consoles began when Sega released the Dreamcast on November 27, 1998 in Japan. 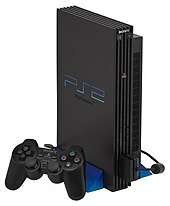 This generation came to an end when Sony discontinued the PlayStation 2 on January 4, 2013. ^ The eighth generation of video game consoles began when Nintendo released the Wii U on November 18, 2012. This is the current generation of video game consoles. The first console of this generation to be discontinued is the Wii U, on January 31, 2017; the other major consoles from Nintendo, Microsoft and Sony remain in production. ^ "The Big Fight". Next Generation. No. 24. Imagine Media. December 1996. pp. 38–41. ^ Buchanan, Levi (May 31, 2007). "ODYSSEY: 35 YEARS LATER". IGN. Archived from the original on December 1, 2016. Between 1970 and 1972, Magnavox and Baer work together to fully develop the Odyssey. The set release date: May 1972. The era of video games is about to explode. ^ DeMaria, Rusel; Wilson, Johnny L. (2003). High Score! : The Illustrated History of Electronic Games (2 ed.). McGraw-Hill. pp. 363, 378. ISBN 978-0-07-223172-4. ^ "Channel F | The Dot Eaters". thedoteaters.com. Archived from the original on October 23, 2013. Retrieved November 30, 2016. ^ Patterson, Shane; Brett Elston (June 18, 2008). "Consoles of the '80s". GamesRadar. Retrieved April 1, 2011. ^ "PC-Engine". PC-Engine. Retrieved January 9, 2018. ^ "PC-Engine". Pc-engine.co.uk. Retrieved December 25, 2017. ^ "Longest support for an arcade system". Guinness World Records. Retrieved November 30, 2016. ^ "PlayStation Cumulative Production Shipments of Hardware". Sony Computer Entertainment. Archived from the original on July 22, 2011. Retrieved December 12, 2012. ^ Reserved., . All Rights (April 17, 2014). "Press Start: Sega's failed Dreamcast console has actually outsold Nintendo's Wii U (sort of)". canada.com. Retrieved November 30, 2016. ^ "PlayStation 2 manufacture ends after 12 years". The Guardian. January 4, 2013. Retrieved January 4, 2013. ^ Dybwad, Barb (September 15, 2005). "Xbox 360 launch date is November 22". Engadget. Retrieved March 14, 2013. ^ "Sony's PS3 makes U.S. debut". USA Today. November 17, 2006. Retrieved January 14, 2008. ^ "Achievement Unlocked: 10 Years – Thank You, Xbox 360". Xbox Wire. Retrieved January 22, 2017. ^ Ackerman, Dan (May 30, 2017). "Sony PlayStation 3 ends shipments, fulfilling 10-year promise". CNET. Retrieved August 16, 2017. ^ "Wii U Production Has Officially Ended in Japan". Siliconera. January 31, 2017. ^ "The First Video Game". Brookhaven National Laboratory, U.S. Dept. of Energy. Retrieved April 15, 2008. ^ Baer, Ralph H. (2005). Videogames: In The Beginning. Rolenta Press. pp. 52–59. ISBN 978-0-9643848-1-1. ^ "How Video Games Invaded the Home TV Set". Ralph H. Baer Consultants. Retrieved October 15, 2014. ^ Atari Games Corp. v. Nintendo of America Inc. , 975 F.2d 832 (Federal Circuit 1992). ^ "The Atari Lynx". ataritimes.com. 2006. Archived from the original on August 10, 2006. Retrieved August 20, 2006. ^ Beuscher, Dave. "allgame ( Atari Lynx > Overview )". Allgame. Retrieved September 21, 2008. One drawback to the Lynx system is its power consumption. It requires 6 AA batteries, which allow four to five hours of game play. The Nintendo Game Boy provides close to 35 hours use before new batteries are necessary. ^ a b Blake Snow (July 30, 2007). "The 10 Worst-Selling Handhelds of All Time". GamePro.com. Archived from the original on February 1, 2010. Retrieved January 2, 2010. ^ "PCs Versus Consoles". Next Generation. No. 18. Imagine Media. June 1996. p. 1. ^ "Introduction by Nintendo". Nytimes.com\accessdate=October 10, 2017. ^ a b c Boyer, Steven. "A Virtual Failure: Evaluating the Success of Nintendos Virtual Boy." Velvet Light Trap.64 (2009): 23-33. ProQuest Research Library. Web. May 24, 2012. ^ a b King, Geoff; Krzywinska, Tanya (2006). Tomb Raiders and Space Invaders : Videogame Forms and Contexts. ^ Lisa Foiles. "Top 5 Hardware Super Fails | Top 5 with Lisa Foiles Video Gallery | The Escapist". Escapistmagazine.com. Retrieved June 20, 2014. ^ Kent, Steven L. (2001). The Ultimate History of Video Games: The Story Behind the Craze that Touched our Lives and Changed the World. Roseville, California: Prima Publishing. pp. 508, 531. ISBN 978-0-7615-3643-7. ^ Retro Gamer staff. "Retroinspection: Sega Nomad". Retro Gamer. No. 69. pp. 46–53. ^ Sheff, David; Eddy, Andy (1999). Game Over: How Nintendo Zapped an American Industry, Captured Your Dollars, and Enslaved Your Children. online . GamePress. ISBN 978-0-9669617-0-6. OCLC 26214063. ^ "N-Sider Profiles". Retrieved August 19, 2008. ^ "Hirai targets 150 million PS3 sales". GamesIndustry.biz. July 21, 2008. Retrieved July 21, 2008. ^ "Hirai wants PS3 to beat PS2". Eurogamer. July 21, 2008. Retrieved July 21, 2008. ^ "Consolidated Sales Transition by Region" (PDF). Nintendo. May 7, 2014. Archived from the original (PDF) on October 29, 2014. Retrieved October 29, 2014. ^ Martin Hilbert; Priscila López (1 April 2011). "The World's Technological Capacity to Store, Communicate, and Compute Information" (PDF). Science. 332 (6025): 60–65. doi:10.1126/science.1200970 – via Peter Sheridan Dodds. ^ Yin-Poole, Wesley. "Peter Moore recounts $1.15bn Xbox 360 Red Ring of Death saga". Eurogamer.net. Eurogamer.net. Retrieved 2 July 2015. ^ "What are the types of removable storage media is supported by the PlayStation 3 computer entertainment system?". Sony. Archived from the original on July 13, 2012. Retrieved July 3, 2009. ^ "Wii U Sales". Retrieved September 9, 2016. ^ "Nintendo Best Selling First Party Wii U Games". Retrieved September 10, 2016. ^ "Next Gen Consoles: Too much connectivity - Blog by flavi0 - IGN". IGN. ^ "Why you should wait on a Wii U (review) - GamesBeat - Games - by Rus McLaughlin". VentureBeat. ^ "Next Gen Xbox Reveal Confirmed for May 21". Den of Geek!. April 24, 2013. Retrieved April 24, 2013. ^ Jessica Conditt. Nearly 10 million Xbox One consoles shipped worldwide, engadget.com, November 12, 2014. ^ "IR Information : Sales Data - Hardware and Software Sales Units". Nintendo Co., Ltd. Retrieved March 31, 2017. ^ Makuch, Eddie (April 27, 2017). "Nintendo Switch Ships 2.74 Million Units Worldwide". GameSpot. Retrieved April 27, 2017. ^ Dauer, James (March 20, 2006). "Sonic: A History - From South Island to Cosmic Eternity". Retrieved June 9, 2007. ^ Kevin Horton (April 18, 1997). "Cart Information". 6.00. Archived from the original (.txt) on July 3, 2007. Retrieved June 9, 2007. ^ Polsson, Ken (May 9, 2007). "Chronology of Video Game Systems". Retrieved June 9, 2007. ^ Richard Talbot-Watkins (June 10, 1998). "Sega master system technical information" (.txt). Retrieved June 9, 2007. ^ Jeff Bogumil (September 27, 1997). "Sega MASTER SYSTEM Frequently Asked Questions". 2.06. Archived from the original (.txt) on June 26, 2007. Retrieved June 9, 2007. ^ "Nintendo DS Details Explosion - Screen, Battery, GBA Compatibility and More". January 29, 2004. Archived from the original on February 12, 2008. Retrieved June 9, 2007. ^ Sarju Shah (June 7, 2011). "E3 2011: Sony PlayStation Vita: Inside and Out". GameSpot.com. CBS Interactive, Inc. Retrieved June 11, 2011. ^ Swearingen, Kirsten; Peter Charles; Nathan Good; Laheem Lamar Jordan; Joyojeet Pal. "How Much Information? 2003". Retrieved June 20, 2007. ^ "Family Computer Disk System". January 20, 2000. Retrieved June 20, 2007. ^ "Interview: IBM GEKKO (part II)". Retrieved January 30, 2014.